I took this photo using a tripod and self-timer. 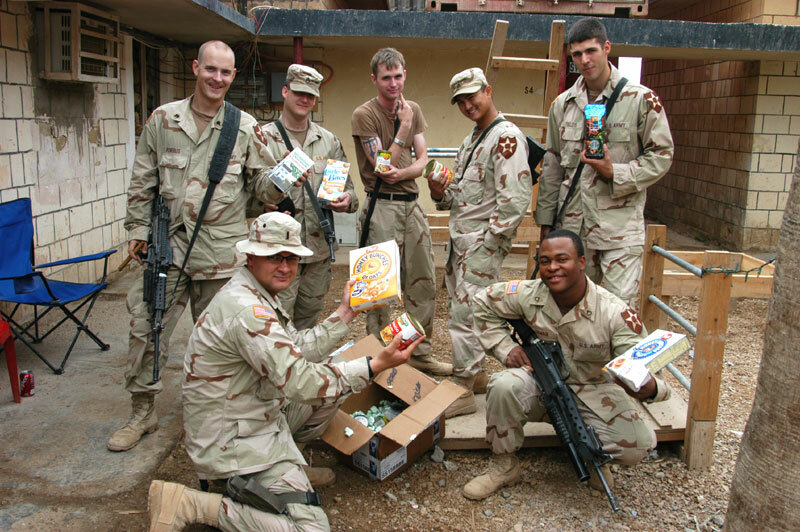 American people supported us by sending care packages with a variety of items--all of it appreciated. It came through several sources, facilitated by sites such as Operation AC and Any Soldier; through other groups formed at the grass roots level; and of course from individual family members. This care package was sent by my mother and people at my alma mater, Hueneme High School. This photo ended up making its way around the internet, and somebody told me they saw it during a photo montage televised on CNN, though I missed it. That's me in the foreground with the cereal and can of menudo, and these are the bold men of my section with their machine guns, M16s and grenade launchers.